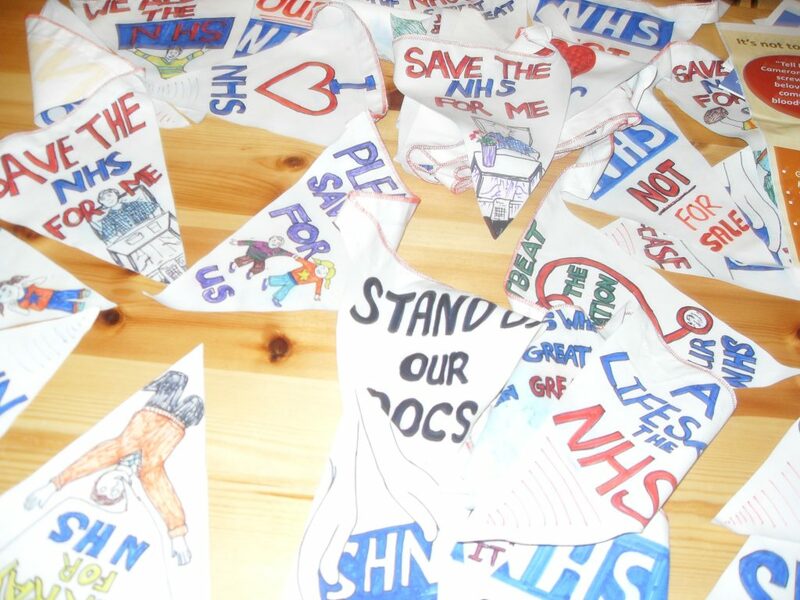 Since the start of the NHS, multiple types of activism have sought to protect, save, change, or shape the Service. The British Medical Association’s early opposition to the NHS has been well-documented, but other trade unions and professional bodies also surveyed their members’ views and lobbied for change, including the Medical Practitioners Union and the Socialist Health Association. Other members of the public, too, expressed their views through consumer and voting behaviours. By February 1944, 600,000 people had purchased the Beveridge Report, which brought together previous progressive ideas to propose the implementation of a new, universal health care system, to sit alongside new systems of family allowances, national insurance, pensions, and unemployment benefits. While the document was long and complex, street interviews by Mass Observation testified that its ideas were taken up across British society. I recall the announcement we heard on the radio in July 1948, when I was 16, that the National Health Service would be starting next day. I was delighted, exuberant even, and wanted to celebrate with other people. I even climbed a tree to see if anyone was around- there was no-one! A challenge for my research is in uncovering everyday feelings about the NHS over time, such as this. Small-scale behaviours –a sixteen year old jubilantly climbing a tree – are significant and meaningful, but rarely recorded contemporarily. I often access these everyday moments through public events, oral history, and social survey, but then in doing so have to grapple with how memory is shaped over the passage of time, particularly around discussion of moments which are now regarded as ‘historic’, like 5 July 1948, and which also relate to tense ongoing debate about the NHS’s future. While some celebrated the NHS’s foundation moment, another challenge for my research is in understanding the feelings of those who simply did not care, and who remain disengaged or disinterested in health or politics. At the inception of the NHS Mass Observation found that in many in London and Manchester took ‘perverse pride’ in being disinterested in welfare reform, or just ‘just did not know’ about it. Disinterest does not tend to leave an archival trace, however unpicking its causes is important. For the people of London and Manchester, for example, did they provide such answers as they were: suspicious of the survey-takers, or of government reform? busy rebuilding their lives after a brutal war? or perhaps simply feeling acceptance of the new Service, and wishing to discuss it no more? While some have been disinterested, there is also a mass of types of political action around the NHS to explore – the work of Leagues of Friends and volunteers, protests by trade unions, clinicians, and members of the public; campaigns against specific hospital closures; voting behaviours; letter-writing, petitions, and legal challenges. Examining such campaigning it is important to consider what, exactly, people have been looking to protect or to save – whether it is the perceived ‘founding principles’ of the NHS, the operation of a particular service or hospital, or a broader sense of values and beliefs seen to be enshrined or embodied within the Service. It is also important to think about the multiple identities through which people mobilise. Due to the ubiquity and ‘bigness’ of the NHS, many act at once as members of communities, clinicians, parents, patients, volunteers, friends, supporters, political party members, and citizens. Politicians themselves have been patients, and have also mobilised in defence of local hospitals while simultaneously advocating sweeping cuts across the NHS. For this campaigner, her activism had changed due to her age, but also entwined with perceived changes in police and media working. New movements – such as Momentum – bring young people to campaign around the NHS as part of a broader social and political agenda, and my research is also interested in how generations view one another, and how the inter-generational encounter manifests itself in campaigning. In general, my research looks to raise questions about what the NHS means to people, and about how relationships with the NHS change with shifts in our personal lives – such as ageing – but also with largescale social changes, particularly shifting relationships between publics and medical, political, or legal expertise. The NHS is an important case study in this regard, as it is relatively new yet also reaches high levels of popularity, and given its perception as belonging to ‘the people’, or as ‘our NHS’. If you have any views on, or memories about, this topic, I am keen to hear your story. Please do comment below, contribute any photos or memories, or email me directly at J.Crane.1@warwick.ac.uk. •	Being hospitalised for 10 days at the age of 7 with glandular fever. Confined to bed. Ex-army Ward Sister who wielded her road-drill-size hypodermic with venom. Lousy meals – therefore being pleased as punch when tonsillectomy patients couldn’t face their post-op strawberry jelly and ice-cream so it came to me instead. Tonsil removal was a very “on-trend” procedure at the time. No visitors – GP and local Vicar only. Lost a lot of weight then ate everything my Mother could provide once I was delivered home. •	A new baby brother who suffered pneumonia in the Big Fog of 1952/3 and was treated with the “new” penicillin which nearly killed him. The GP visiting on foot because the smog was so thick. Like the ward sister, our GP was also ex-army and certainly did not have a gentle bedside manner. •	Drill/fill-or-extract dentists (who didn’t get paid to give preventative advice). •	Awful NH spectacles for those unfortunate enough to need them. One lens often covered over with sticking plaster to correct a squint. Broken bridges repaired with sticking plaster. •	Boils, styes, whitlows very commonplace. Doctors’ time occupied with treatment of such whereas today a pharmacist is more likely to advise. Today is so remarkably different. Patients can inform themselves because medicine in all its formats is easily researched by the population at large. Medical professionals listen to their patients, their hopes, their fears. Keeping and staying fit is becoming understood as a guiding principle, a lifestyle choice. Don’t know if any of the foregoing is likely to spark a train of thought for you – but at least I’ve got a few things off my chest! This is all really useful and interesting – thank you for these reflections! It’s important I agree to think about stressful aspects of care and issues in the medical treatment of the past, as well as romanticising the post-war moment or the 1950s. Also useful to think about patients informing themselves, and researching their medical conditions, today, as a form of activism.